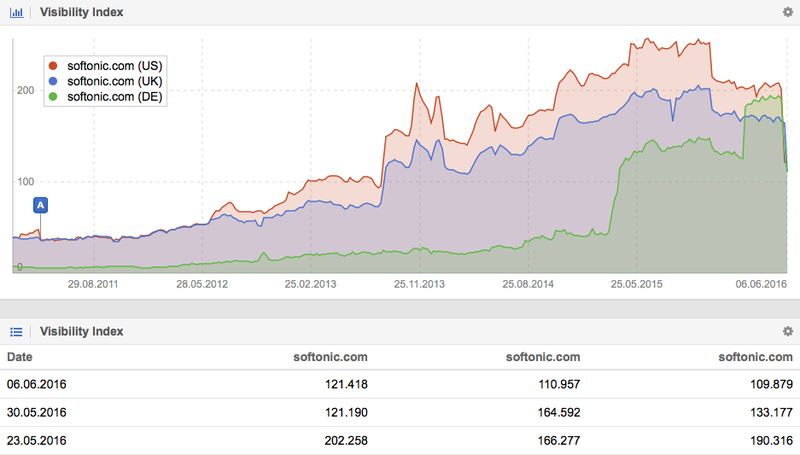 The Visibility history for Softonic.com shows a large loss on Google US (-40%), UK (-33%), Germany (-42%), Italy (-61%), France (-53%), the Netherlands (-31%), Brasil (-43%), their home-market Spain (-45%) and many more search markets. For our analysis, we will therefore simply stay on the US market, as the cause is always the same, for all countries. When we take a look at the Visibility for Softonic's most visible directory, /s/, on Google US, we can see a major loss in Visibility. Before, this one directory made up a whopping 40% of the entire domain's Visibility (84 Visibiliy poinst from the total of 208 points for the entire Domain). Now, this directory makes up less than 0,5% of the domain's Visibility. What happend to the /s/ directory? First we need to figure out what exactly this directory used to contain. If you would like to take a look at the entire list, simply click here. 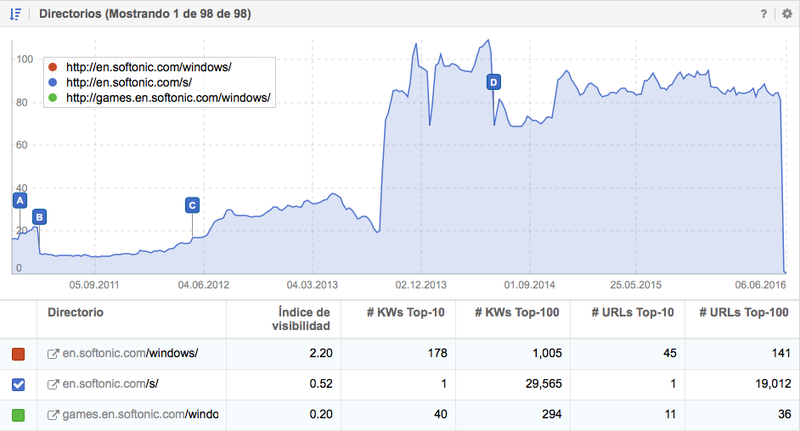 When we look at the rankings for the previous weeks, before the loss, we see that Softonic used to rank for the searchquery “microsoft office” with the URL http://en.softonic.com/s/microsoft-office/. When we open this URL in our browser we see that this page is actually the internal search for this keyword. The more we look at the results in the above list, the more it becomes apparent that every result in the /s/ directory is an internal search page on Softonic. Therefore, “SERPs in SERPs”. This paves the way to a problem that has been plaguing Google for ages: search results within their search results. Back in 2007, Matt Cutts already felt it necessary to write an article on the problems such internal searches can cause. If you check out Google’s Webmaster Guidelines, you will find the important part in the “Doorway pages” section: Substantially similar pages that are closer to search results than a clearly defined, browseable hierarchy. Many website operators like to employ this powerful strategy of using category-pages to rank well for important keywords. This strategy can have many different faces. Here are some examples which work well: The Spanish newspaper Elpais.com, the German newspaper Sueddeutsche, Theguardian.com and Quora.com (it use its HTML sitemap as a category-page). Using category-pages can be a great idea, which can really help you rankings. You just have to be careful of how you implement this strategy, as Google has been making it plain, for years, that they do not want to have search-results within their index. At their core, category-pages are often created through internal searches, which list all articles on a website for a specific keyword and this is exactly what may invoke Google’s wrath. For Softonic.com (their category-directory was /s/), the problem was not that they used category pages, but that they created the content on these pages through their 1:1 internal search. So, in order to keep Google happy, it makes sense to invest more labour than might actually be necessary to create and curate your category-pages. Even then, they will be those pages on your domain which pull in the most visitors with the least bit of effort. Please keep in mind: Figuring out when Google will accept a category-page and what they consider to be a searchresult is essentially a balancing act. Google does not offer any clear guidelines on the matter. Though, naming your directory /s/ for search does not leave much room for interpretation. Softonic’s spokeswoman Jennifer Woodard confirmed our suspicions yesterday, after we published the Spanish version of this blogpost. They were hit by a “thin content” action against their search pages. The Softonic team is currently working on fixing the issue and we wish them all the best in their efforts! Finally! this spam was amazing and it ranked extremely well not only for longtail! After a lot of “Pandas”, this thin content was ranking even better! The success of this technique determined cnet.com to do the same.